As we were walking home from school the other day, having had a chat about different parenting styles, our youngest said to me: "Mum, you're not a tiger Mum, or a helicopter parent, or a snowplough Mum - you're a hamstery Mum." "Because you give me cuddles and I can play with you all the time." Not that she's after a hamster or anything. The words "subtle as" and "brick" spring to mind. But I think that I may have solved the problem without resorting to buying an actual, real, hamster. You see our youngest loves my jumpers, especially really soft, furry ones. And fortuitously, jumpers which look like they have hamsters attached to them are a huge micro-trend at the moment (if that's not an oxymoron). Look, see what I mean. 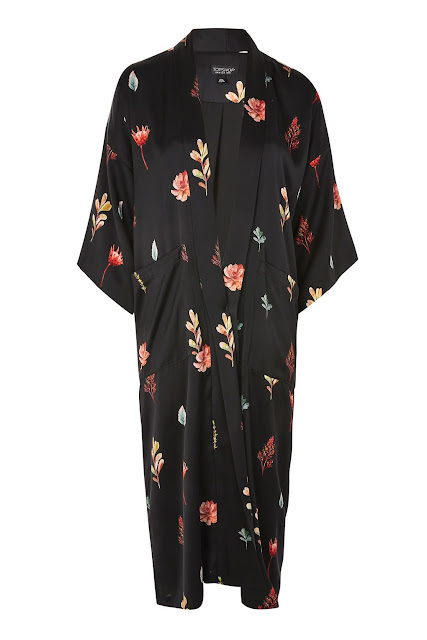 OK moving swiftly on, nope, I CANNOT find it - the Topshop jumper that I was after but here we go with some alternatives. 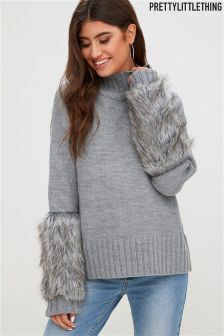 Pretty Little Thing fur sleeved jumper at Next (£35). The fur on this probably resembles a rabbit more than a hamster but that's not necessarily a bad thing. It could be good for those who have children who are badgering them for a rabbit. The Zara fur sleeved top (£25.99) is a nod to this micro trend and arguably slightly more hamster like in its colouring. There are two really good options in Mango but for some reason it's not possible for me to upload the photographs. This post isn't going so well is it?! 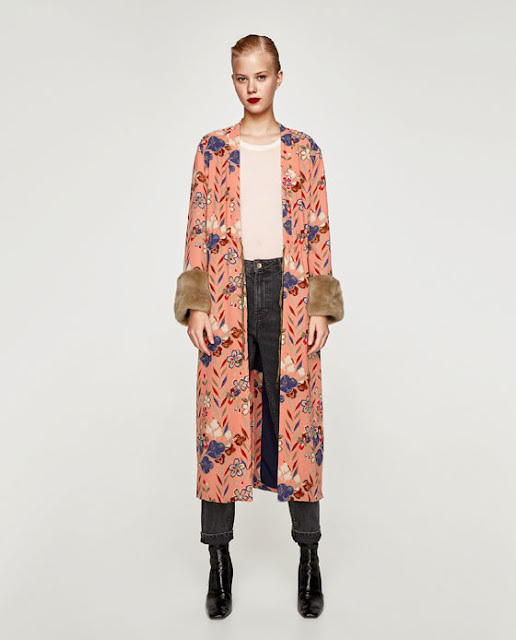 But here are links to them in any event - there's the fur sleeved sweatshirt Mango (£29.99) and the Mango fur sleeve cardi (£59.99) - both are fab! Apparently we're going hamster shopping on Saturday #fail. 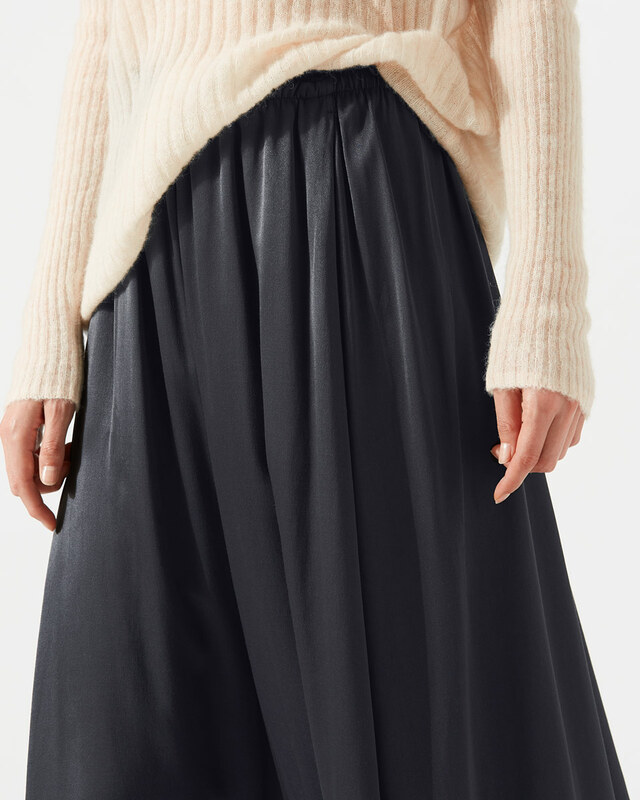 Jigsaw's three alternatives to the pleated skirt. I'd pretty much decided before I collected it, that the pleated skirt from Marks & Spencer would be going back but actually, I really liked it - particularly the SWISH! The reason that I thought it would be going back was because I decided that it looked so lovely on Maryam (who wore it on here a couple of posts ago) that I would just hate it on myself. But the colour is vibrant and fun and it moves beautifully.....so it may get to stay. 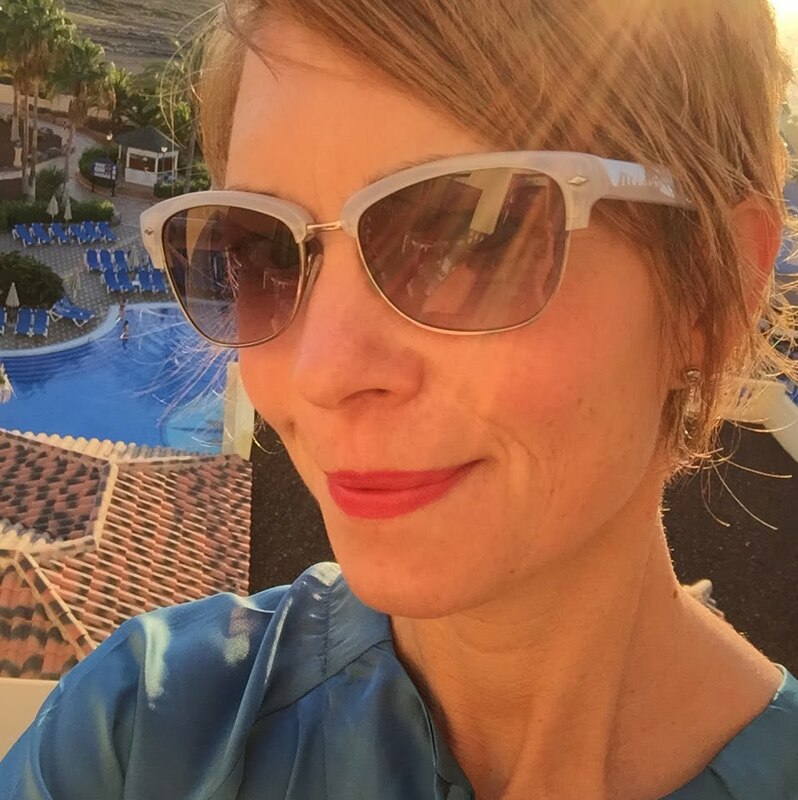 But the whole reason for this post is that, from the messages that I get, I think there are whole host of ladies who love the idea of a pleated skirt but who haven't yet managed to hunt down the right one. So I've come up with three alternatives to a pleated skirt - two of which are actually pleated skirts but just bear with me - which might just do the trick. This is the Jigsaw multi coloured pleated skirt (£199) and it's from their English Eccentrics range for A/W. Although it is undoubtedly more pricey than many of the things that I feature on here, it is totally beautiful in the flesh and perfect for a Winter wedding, for Christmas, for a party, or for every day, just because you love it. It's 100% polyester so it has that lightweight floaty quality and it doesn't add any bulk to the frame. Nor is it boardy and stiff like some of the metallic skirts can be, which I always think is a shame because they just don't move with you. 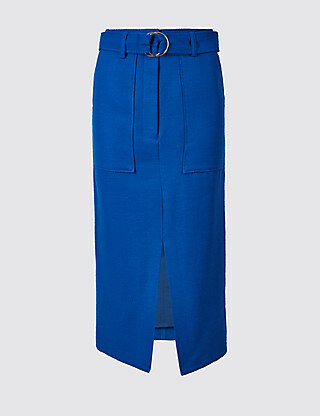 The colours in the skirt are stunning and the way that it's panelled keeps the eye on the move. I love the idea of picking up the brighter blue, or the navy, in a fitted jumper. I held this skirt up to me and it was more of a mid calf length - but then again the model is 5ft 10" so that might explain it. One tip when trying on these style skirts is that you must move in them. Even take a video if it helps. Rarely do we stand completely still and when a pleated skirt moves, it can be really much more flattering than when you're standing straight on looking at it in a mirror. Twirl, walk, sway and swish and watch how it moves with you. The colour of this Jigsaw pleated iridescent skirt (£140) is absolutely stunning. As it says in the description of this skirt, it has a subtle A-line shape, being fitted at the waist and flaring slowly down to the hem. Again it's 100% polyester, with a lining and an iridescent outer layer, which is sheer towards the hem. I like this skirt because it's less "formally" pleated than a proper pleated skirt. It's a bit like a hair style which has loose, natural curls, as opposed to a very tight perm. 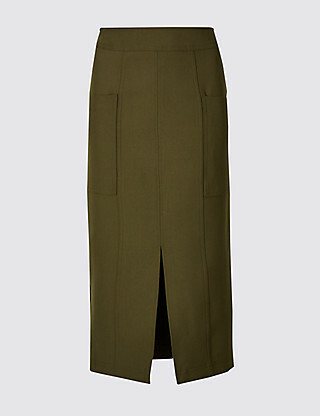 So this skirt could potentially be an option as an alternative to a pleated skirt. Finally there's the Jigsaw heavy satin fluid skirt (£120). It comes in grey (above) a dark green and also magenta. This skirt is 100% viscose so again very fluid and rather than having pleats, it has gathers, which drape from the waistband. The first skirt has kind of snuck in by the back door although to be fair, despite the fact that it's pleated, it is a very floaty fabric and it has beautiful detailing which could be really flattering. The other two options are more relaxed than the knife pleats. So have a play, put the waist band lower down towards the hips and see how it works. 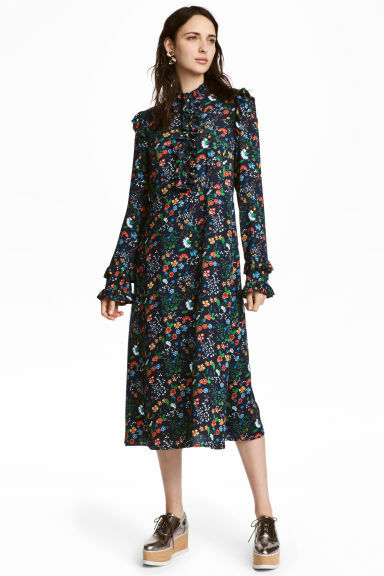 Try it with a heeled ankle boot and a knit which doesn't come down too low over the hips. Have a swish and a sway in it and do let me know how you get on! It's the pink front door but not as we know it! Can you believe that I just spent an hour drafting this post and lost the entire thing? Argggh. So, luckily for you, this is the abridged version. You know how I mentioned that red was "THE COLOUR" of the season only a day or so ago? Well yellow, ochre, mustard....whatever you want to call it, is having a moment too. It's great with navy, black or grey, giving that lift to an otherwise dark winter outfit. 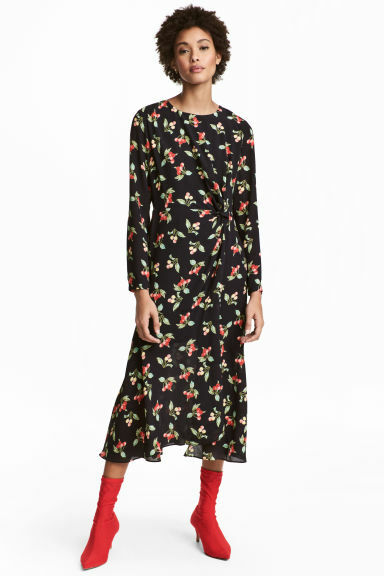 I love this layered midi dress from Topshop (£115) and I keep going to look at it every time I'm in there. True, it would require a not inconsiderable amount of tape to keep everything in place but it's lovely - and a little different too. 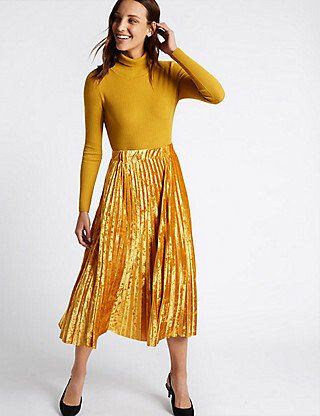 There "may" be one of these M&S gold pleated skirts (£35) waiting for me to collect from my local store but I doubt that it will look anywhere near as good on me as it does on my friend Maryam, above. Never mind, there's always the navy option. I prefer the idea of a cream jumper as Maryam's wearing, or a black turtle neck with the gold skirt, rather than the mustard top as above but you know, horses for courses and all that. The silk satin batwing top Jigsaw (£85) is a beaut of a top. 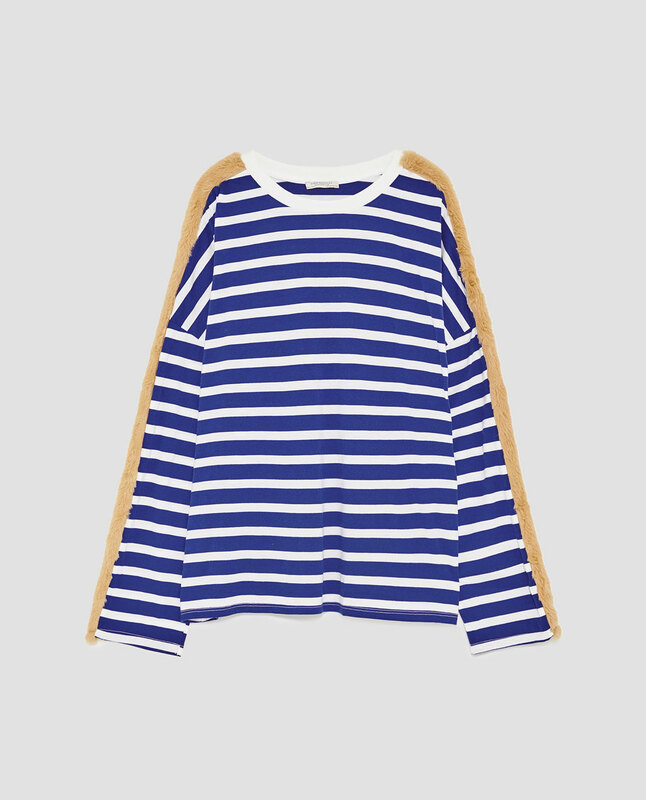 Jigsaw release this style every season and it's just such a brilliant top that it deserves a post of its own. The neck is low enough for those with a curvy bust, it's flattering over the tummy, it doesn't add bulk and it's a modern shape. This Zara wool cardigan (£39.99) probably falls into the category of a more "traditional" yellow cardigan, as in the yellow of an egg yolk, or the sun, or a daffodil. 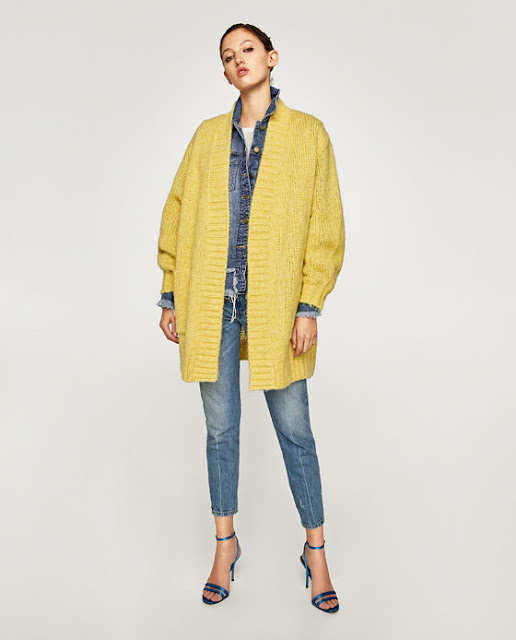 Chunky cardis are such a staple in a winter wardrobe that a bright yellow one is really refreshing. 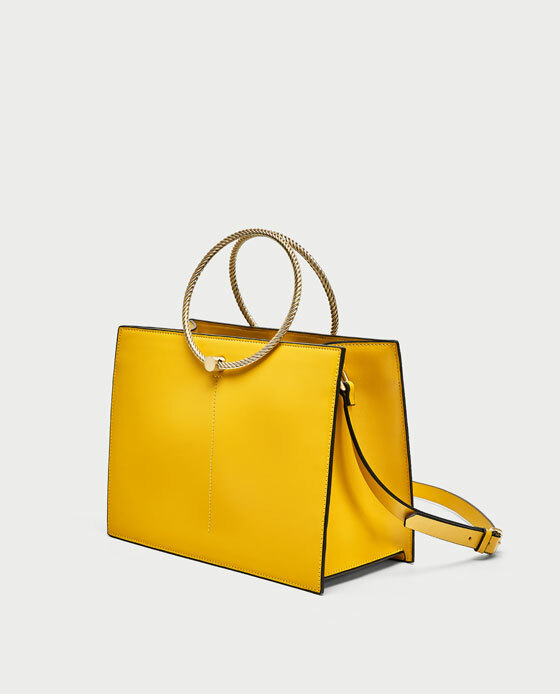 For those who don't like the idea of yellow in their torso, then accessories are a fantastic option instead and this Zara tote bag (£39.99) ticks the ladylike box and the circular handle box in one. 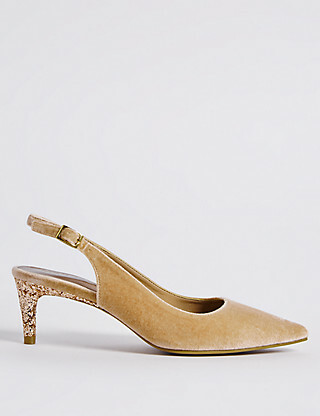 And whilst these M&S kitten sling back court shoes (£29.50) don't actually comply with the yellow/ochre/mustard brief, they are totally gorgeous and in fairness, someone does describe them as mustard in a review. But issues of yellow aside, velvet is soft so great for your bunions, the kitten heel means that they don't hurt the balls of your feet too much and the glitter heels are, well, glittery. And therefore they deserve to be included. So whether it's mustard, ochre, yellow, or custard, give it a whirl because it's a great way to give your winter wardrobe a lift. 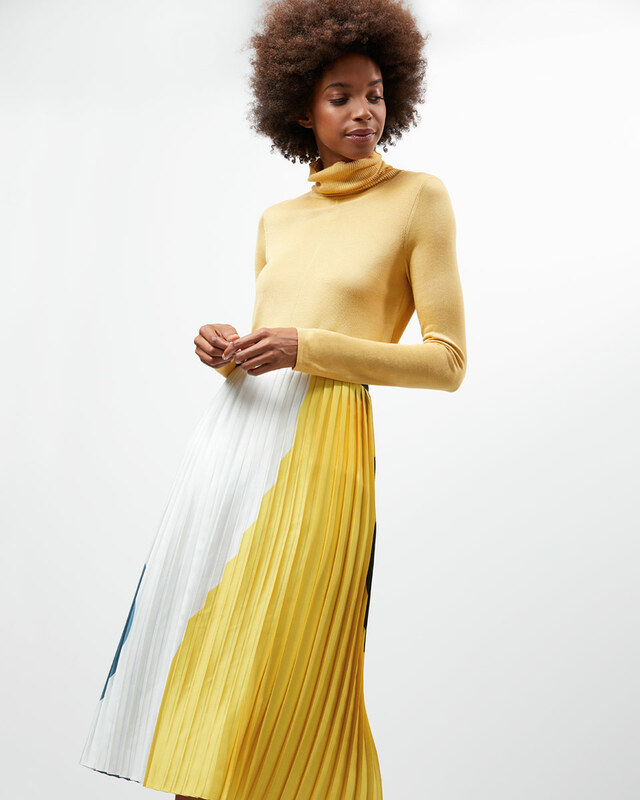 I've not really been there before on the mustard front but I can feel a mustard purchase coming on - aside from the pleated skirt that its. That's gold so it doesn't count. I know the Queen...no, really, I do! Sparkles galore! No. Really, I do know the Queen. Or at least I know two people who look very much like the Queen. My Mum and her sister that is. Only the other day someone kept looking at my Mum in the Post Office queue and finally they asked her if she was the Queen. Obviously the Queen often queues in Breaston post office. And when my Aunt responds that she's not the Queen, people ask her if she's sure. But anyway, yet again I have digressed because for those who haven't come across I Know The Queen it first started in 2012. It is a luxury accessories brand with "an eye for experimental designs and fun". In fact as they say on their site "the more ridiculous the idea the more we love it." Amongst the many lovely things that they sell (more about those below) is the Gold lightening bolt glitter sticker £7, which I stuck onto an LK Bennett floral print bag that I bought from Bicester last week. In fact, if you look closely, I think that I put it on upside down - which I figured was highly likely as I was doing it. Sometimes being left handed makes me see things differently. But I've switched it round now so all is well. Stickers are a great way of personalising new things, or giving a new lease of life to older pieces. And lightening bolts - well they're just taking over the world right now aren't they? 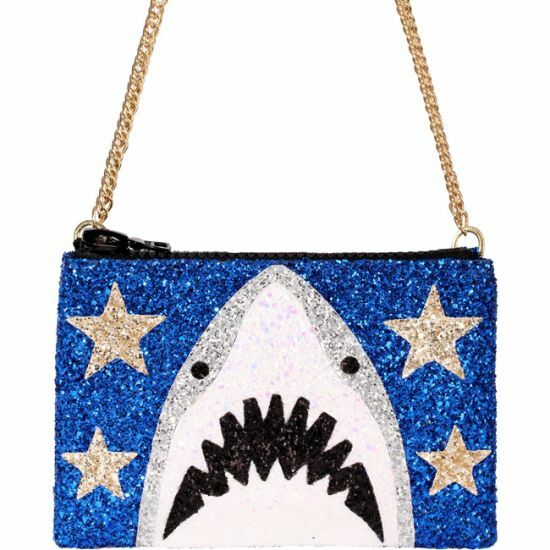 This shark glitter bag (£69) has to be one of the best bags I've ever seen. You've got to love a bit of jaws! I remember watching it for the first time. In fact who doesn't remember watching Jaws for the first time? 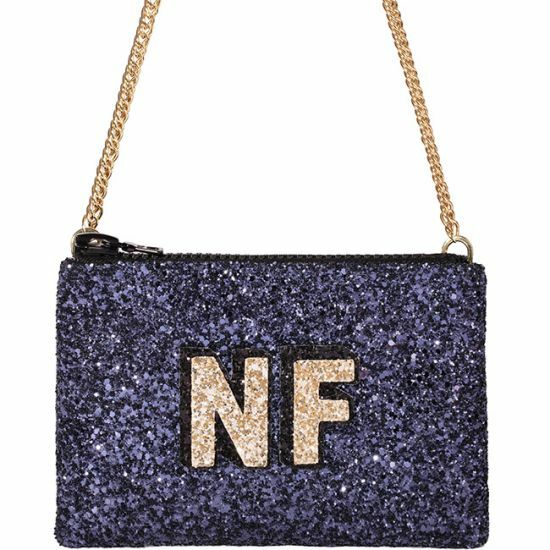 Or how about a personalised cross body glitter bag (£69). Would this not make the best gift ever - possibly to yourself? 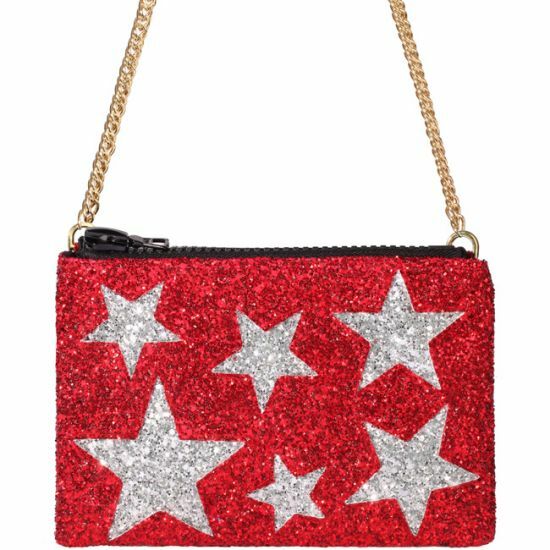 Or how about the stars cross body glitter bag (£69)? This is an absolute beaut! I love the size of it, the sparkle, the stars - everything is just spot on. The full range of stickers includes letter, stars, red lips, hearts, hashtags and dollar signs and you can find them all here. There are some fab pieces on the I know the Queen website so if you've got a few minutes and if you're into sparkles, this could be a good place to spend those minutes. 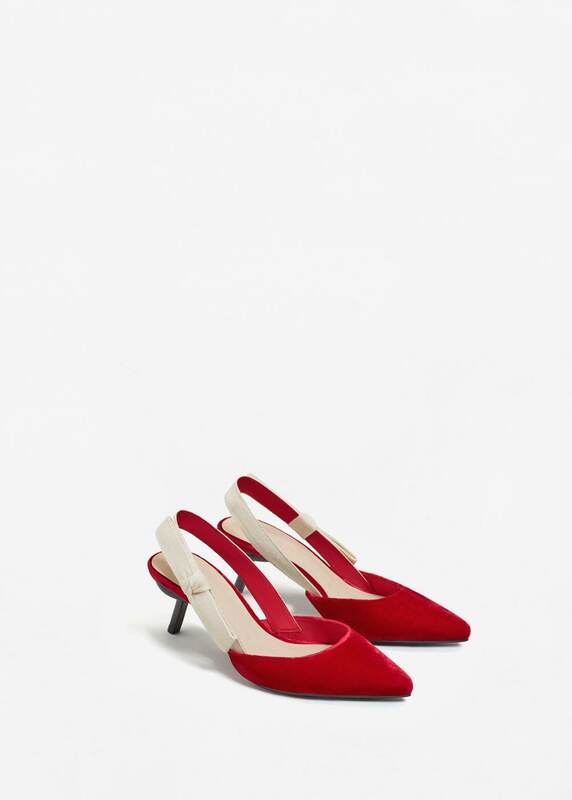 As we all know, red is THE colour of the season. Walk around any clothes shop and items of red clothing will literally jump off the rails and grab you. It's impossible not to notice them. 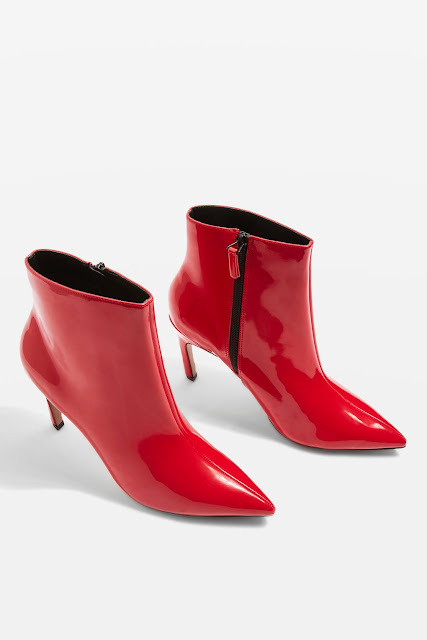 And red boots are having a moment too. Many a friendship has started with a discussion over shoes (well in my case at least) and a bright red pair of boots with black trousers and a blazer is a sure conversation starter in any meeting on a cold and wet winter's day. True, red boots won't be for everyone and the practical amongst you may wonder quite how various ensembles are going to work in the colder months. The answer is that I'm not sure yet. But they will. Maybe the boots will be worn just with trousers, or maybe they will be worn with a full length skirt (or dress) with leggings underneath. We're not there yet though so we don't need to bother ourselves with such icicle inducing thoughts. Oooh actually I do have the answer. Since I've had a bad back I've pretty much had a hot water bottle surgically attached to myself and even though I don't really need it for my back anymore, I still love having one near me. So that's it. A hot water bottle up my skirt. People may well talk - I could look like Kim Kardashian if I place it right - or slightly odd, if I don't. But I digress....for a change. 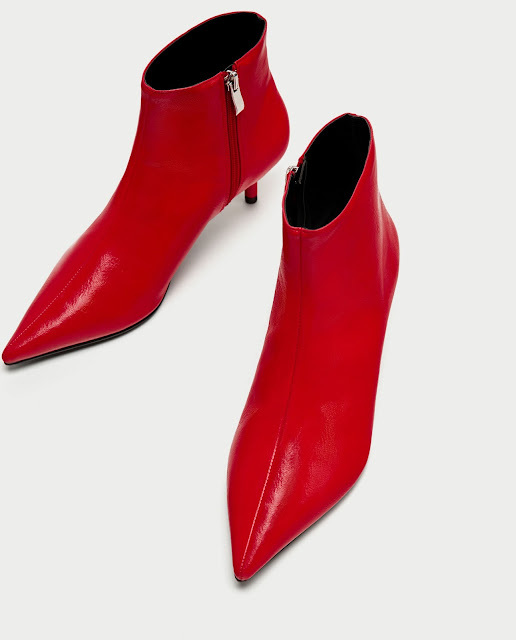 These are some of the red boots that are out and about on the High Street at the moment. There's a selection of ones for wide feet, suede ones, a sock style and a patent style. So hopefully there's something for everyone. 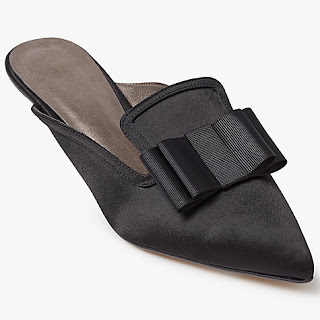 I've just concentrated on kitten heel boots but there are plenty with block heels too. These are the wide fit M&S red boots £69.99. 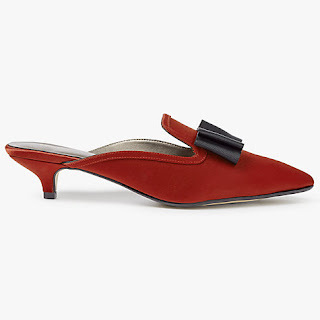 The heel is a good height and they are leather. I'm thinking floral midi dress with these. They're not too taxing in any department - colour, brightness, shininess, heel etc so they are a fairly accessible option. Assuming that they haven't all sold out by now. 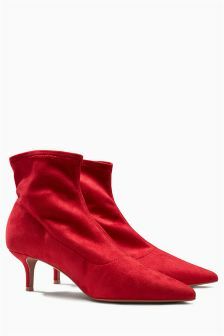 The red kitten heel sock boot Next (£38) are a firm favourite. They have had great reviews with comfort being mentioned quite a few times. They are also a good price and as they are a sock style boot, they will have a neat fit around the ankle, which is great for those ladies on whom lots of boots slosh around their ankles like wellies. Not being particularly svelte of ankle I do not have that issue but I do sympathise with ladies who have very slender ankles. Really I do. Actually I'm lying. I don't at all. But I am very envious. 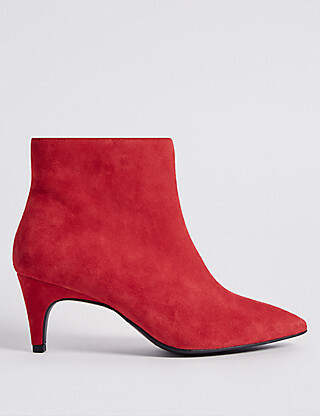 And these are the Topshop hot toddy pointed boots (£59), which are the ones I have. No doubt too shiny for some but I like a bit of shine in the winter and they are the perfect shade of red for me - hot chilli red. I have a few outfits in mind to wear these with but I'll save those ideas for another post. I realise that non of these boots are "stomping across the field" type boots so perhaps we need to think of them more as car to bar type boots, or short school run type boots, or even a trip around the shop type boots. Do you get where I'm coming from? And has a red boot type gap suddenly just appeared in your wardrobe? The eagled eyed amongst you will know from my Instagram posts that I've worn this dress quite a lot recently. I've been road testing it and now I thought that I would share it as I think that it will become a firm favourite. It first came out last Friday when I went to a launch of a new A/W '17 collection in Hampshire with some other bloggers. I wore it again earlier this week when I went to a trend presentation by Red Magazine at Bicester and then again today. When I love something I wear it a lot and if I'm paying a little more for something, I especially want to wear it a lot. That, for me, is real life! 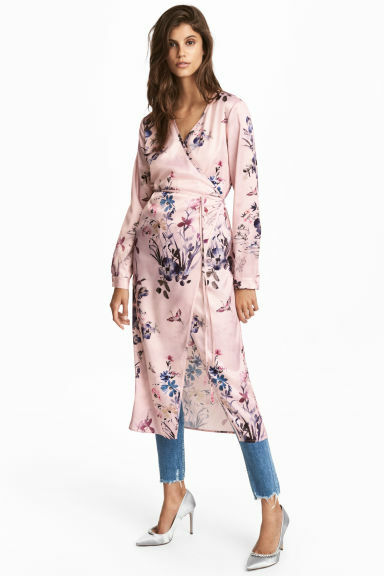 I first saw the dress in our local John Lewis (I can't currently see it on the site) before I went to Guernsey and I fell in love with it because it was a) navy and b) it had a metallic print on it. I am nothing if not utterly and totally predictable. Sparkles would have had me too. When I held it up I thought that it might be too long for me so I left it. Too many other things to think about! But it played on my mind so I re-visited it when I returned and hey presto, it was the perfect length for my 5ft 6" height. I tried on both the 8 and 10 several times but there wasn't much in it, so I went for the 10 on the basis that it might just be slightly looser on the waist, which is quite fitted. As you can see, the split is quite high. I don't know what I will do when it gets colder. Wear long johns probably for a very stylish look. Or grin and bear it. Or maybe wear it over trousers. I'll find a way for sure! Oooh how about a petticoat? Do they do thermal ones? Even better, a thermal, maxi petticoat? Yes, that's the answer for sure. 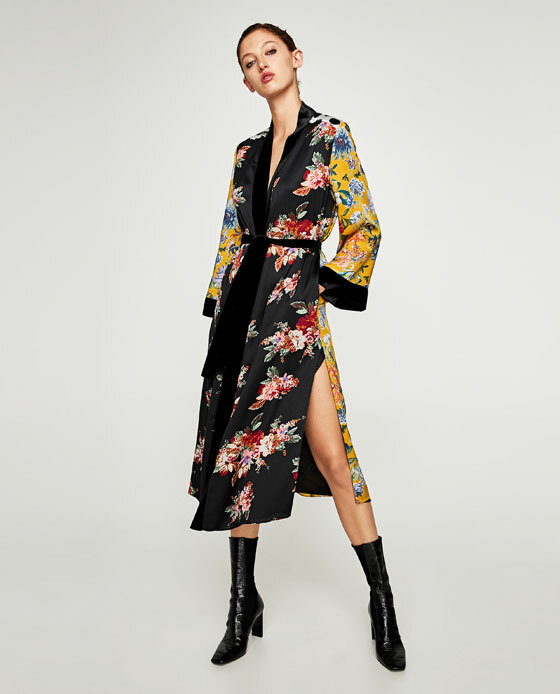 So far I've worn it with trainers (yes, Mrs Predictable strikes again) and gold boots plus I've also got some new red patent boots to wear with it...oh and some suede kitten heel knee high boots from Jigsaw which I bought about 5,000 years ago and have worn precisely once. Or maybe twice. But having been confined to the fashion wilderness for the last 4999 years, they are now good to be worn again so they may make an appearance. I like a dress. You just stick it on, add some fancy pants earrings a bit more jewellery and a pair of shoes and off you go. And in my case, quite possible a thermal maxi petticoat too. Stunning. September, I'm coming for you!